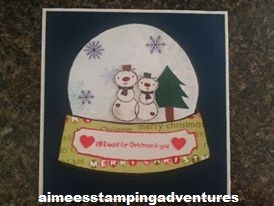 Aimee's Stamping Adventures: First Card Made With Unity Stamps!! Wahoo!!. First Card Made With Unity Stamps!! Wahoo!!. Here is my very first card that I have created using Unity Stamps. I made it for my boyfriend. I really hope he likes it. I think for first one it came out cute. Love the snowglobe! You did a great job and an excellent choice on first time card! Thank you so much for saying that!. You made my morning :). Have a very Merry Christmas. Great job with the snowglobe, Aimee. Aimee, It is adorable! I too love snowmen and I have this stamp. He will love it. Thank you Dana!. He did love it :). Made him smile. Love your snow globe card! Thank you Dawn!!. I had fun making. Thank you so very much. Stamping hugz back.